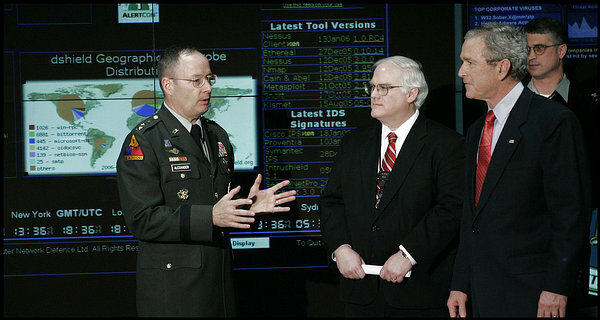 Study, if you will, this picture in the Washington Post captioned: Lt. Gen. Keith B. Alexander, director of the National Security Agency, and William Marshall, another NSA official, give President Bush a tour of the super-secret agency’s headquarters in Fort Meade, Md. Look at the cool, big video display behind Lt. Gen. Alexander! It shows a nifty global map, the current time in locations around the world, an “AlertCon” graphic, and mysterious data-laden charts and tables. Man, I wish I could have that on my computer desktop. Oh, wait – I can! The NSA obtained this up-to-the-minute threat monitoring system by going to this Web page and clicking “Full Screen Display”. Via Boing Boing. Also, here’s the delighted reaction from one of the folks responsible for making that intel available to us all, spooks or not. ← Site updates! Because everyone loves technology marketing.